Everyone is talking about content marketing these days, but successfully executing such a strategy requires the ability to consistently deliver high-quality content on a regular basis. Hiring a journalist or a content marketing manager is a big step in the right direction, but success requires more a team effort. You need a content factory. This factory will include many traditional marketing functions such as copywriting, graphic design and product marketing. But it will also include many of the newer disciplines such as social media, video production and search optimization. 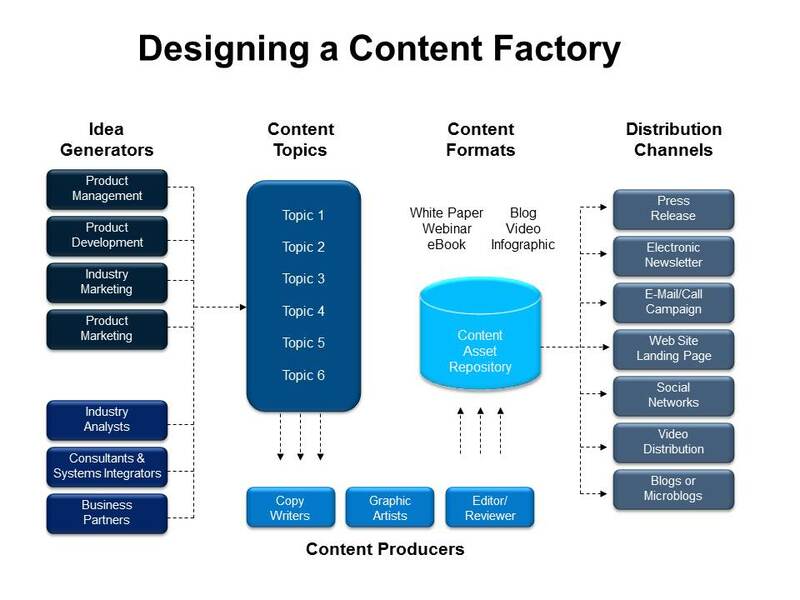 Below are my recommendations on how to structure a content factory. First, identify your idea generators or content sources. There are two types – internal and external. Internally, you can rely on Subject Matter Experts (SMEs) to serve as content sources. 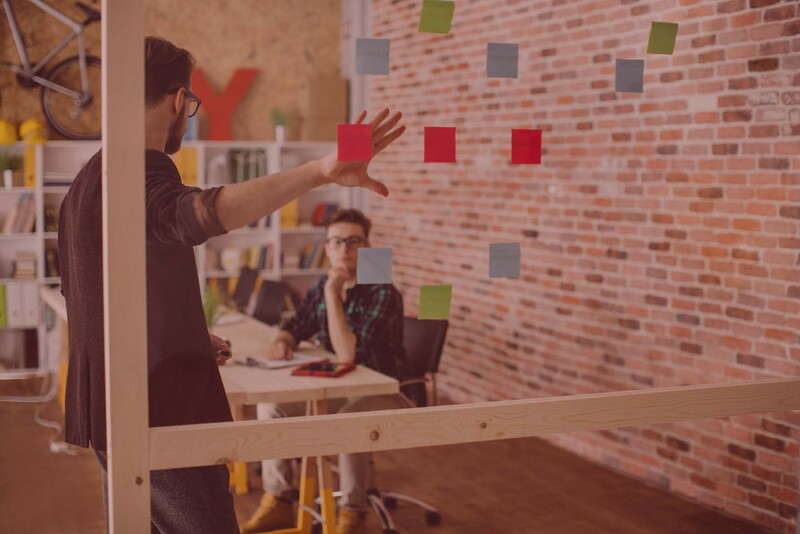 These SMEs are likely in your product management and marketing organizations, but there may be a few others scattered around the business. Next to each of their names you should identify the technology domains, business processes and industry sectors for which they have expertise. Additionally, it is important to assess their writing capabilities and willingness to write. Unfortunately, there is often an inverse correlation between knowledge-level and writing-capabilities amongst SMEs. The second source of content is external. I recommend developing relationships with a group of opinion leaders in your sector. Obvious candidates are the analysts at firms such as Gartner, Forrester and IDC. While these analysts have the best “name recognition,” they are often the most restricted in terms of developing custom content. Tier 2 and 3 analysts that are focused on building broader awareness for their firms can usually offer more flexibility for content initiatives (and they are often cheaper). Subject Matter Experts at business partners such as systems integrators, resellers and consulting firms are another good source of external content. Second, you should identify your key content topics. Having some discipline here will pay off. Don’t choose too many topics – two or three is probably appropriate for most companies. You cannot assume that the market will absorb your message after the first press release. You will need to repeat it consistently for months for it to catch on. The number of content topics you can choose will depend upon the size of your firm and the scope of your target audience. You will also need to decide if you want to focus on broad topics or those specific to a particular buyer persona or vertical industry. Third, you will need to organize at team of content producers. This will consist of graphic artists, copywriters and editors. The content producers are critical, because they will be accountable for consistently delivering a feed of content on a regular basis. If your idea generators (content sources) are strong writers then you will need an editor to conduct a professional review of written content to enforce capitalization and punctuation standards; correct grammar and spelling mistakes; and enforce consistency with your branding guidelines. If your idea generators are not writers, then the content producers will need to copywriters that can interview a subject matter expert then turn around a draft for review. Graphic artists will be critical for this team as well to create illustrations, infographics and imagery to support the content. All of your content should be housed in an asset repository to include white papers, ebooks, webinars, blogs, videos, infographics, case studies, ROI tools and apps. Each piece of content should be tagged so that you can organize lead nurturing strategies for related works. The final piece of the content factory is the distribution aspect. Depending upon the target audience, format and topic you can elect to distribute the content via a number of different channels. Press releases, electronic newsletters, email campaigns, website landing pages, social networks, videos, blogs and microblogs are just a few examples. Great post as always Steve. I’ve seen this model before and think the concept is great – but one thing I rarely see mentioned, but which I think important, is the feedback loop that should exist after distribution and back to the idea generators. The process should be a cycle rather than straight flow, with feedback from web analytics tools (for web and social media traffic), your marketing automation tools (for a breakdown of email response rates) and of course feedback from recipients themselves (where possible). Gathering this feedback, and then sharing it in a meaningful way with the idea generators, will help to redefine the message and ensure a better response rate going forward. In my view it is this piece that so many companies fail to do well and end up jumping from idea to idea simply because they are unaware of what is working, or perhaps worse still – continue with a theme that is simply not resonating!